It is important in any outdoor adventure to pack the right gear. Some say there is no such thing as bad weather, just inappropriate gear. Although we live in a desert environment it is important to pack for all weather conditions. By planning ahead you can and will be ready for anything! 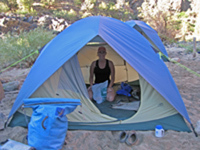 Since ALL of your camping gear is supplied by Sheri Griffith Expeditions all you need to pack is your personal gear. 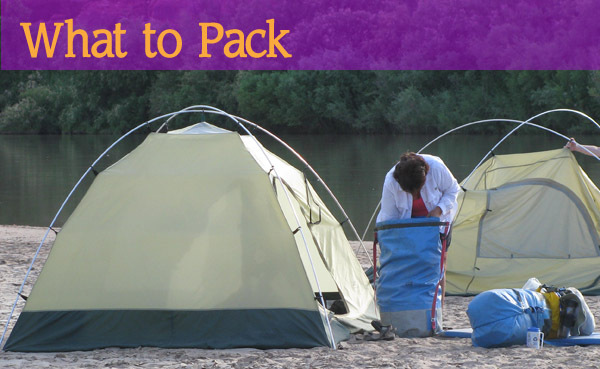 To print out a copy of our packing list, click Here. Here are some tips in packing that will allow you to always be ready for anything Mother Nature might throw at you. Pack clothing that you will not mind getting wet and dirty. 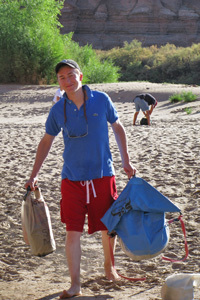 Remember, anything you bring on the river could get wet and sandy! Fast drying, durable, comfortable clothing is best for rafting. Cotton is recommended for hot weather and synthetic polypropylene or wool clothes for cool weather. Make sure your rain gear is always packed in an accessible spot. When you arrive for your trip orientation the night before the trip you will receive 2 dry bags. A third dry bag for your use will be a “community” bag. YOUR PERSONAL DRY BAG- This bag is for the things you only need to have accessible at camp. Think of it as your check luggage bag at the airport. Once you have it packed it will be strapped down for the day. The bag is approximately 20″ x 20″ x 27″. You may pack in an athletic bag for easier access. Items for your personal bag may include: Your sleeping bag, your changes of clothes and, personal toiletry items. DITTY BAG- This smaller bag will be given to you at orientation. Its intended use is to carry all those little things you would like to have with you during the day. This bag is like your purse, yes men can have purses too. It will go on the boat right by your side so you can get into it anytime. Items for your ditty bag may include: Camera, medications, sun-block, lip balm, bandana, sarong, guidebook and your journal. ***Remember: Although these bags are water resistant, it is advisable to protect your things that can’t get wet inside Ziploc bags. COMMUNITY BAG- This bag will be available the morning of your arrival. Its intended use is to carry your raingear and hiking shoes. We recommend packing your raingear in a small backpack or grocery bag. This bag is more accessible then your Personal dry bag, and will be available throughout the day.